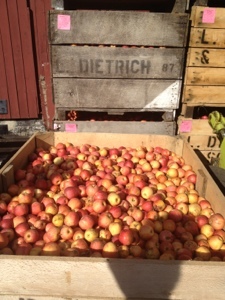 Yesterday, EJ and I made our autumnal pilgrimage to the Dexter Cider Mill. It was awesome. The cider they were pressing was superb. We picked up a gallon and a half-dozen fresh donuts. We consumed them at the park on Huron Creek but not before checking out a free wine tasting from Sandhill Crane Vineyard. It's hard to beat a free wine tasting. Don't drink too much cider. I think I just recovered.